The first industrial revolution took place in the cotton mills of Manchester in the 18th century. Today we are in the midst of the 4th industrial revolution, a digital one often referred to as industry 4.0. 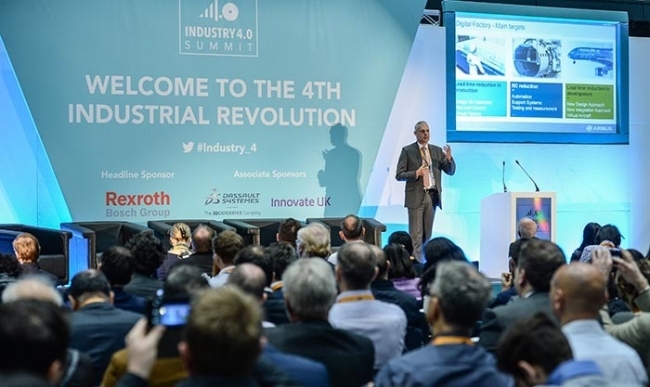 Next week will see a gathering of global digital innovators converging in Manchester at the UK’s largest digital manufacturing event, the Industry 4.0 Summit & Expo taking place 10-11 April at the Manchester Central Convention Complex. Focused on the future of manufacturing from an expert perspective, the Summit will showcase the very latest technologies and solutions designed to make manufacturing smarter all set to a backdrop of compelling round table events, real-world case studies, networking and seminars delivered by a global panel of thought leaders. The Summit will see senior level manufacturing executives interested in developing their own digital strategies discuss the industry’s big issues with leading authorities from government, business, academia and industry associations. Featured topics across the two-day Summit include seminars and round tables on pressing issues such as increasing the uptake of digital technologies in manufacturing, upskilling, delivering profitability in manufacturing and supply chain with Digital Transformation and IIOT, achieving incremental improvements, Introducing factory digitalisation step by step , made smarter funding & using AR/VR in a manufacturing environment. Manufacturers eager to gain knowledge on how to adopt new management strategies to help improve their operations can expect unprecedented access to a world-class roster of Industry 4.0 experts, including representatives from government and industry associates. The two-day event will also offer a deep dive into government policy, facilitate access to finance and provide guidance and support for those ready to adopt the latest business models. Event Director Gary Gilmour said: “Our event attracts visitors across the manufacturing spectrum eager to get a better understanding of how to adopt industry 4.0 and then put this into practice. Our event provides knowledge and solutions, and plenty of case studies from companies who have already started their digital transformation. The Expo portion of the show includes the hands-on IoT workshop, designed for engineers, software developers and researchers. The expo brings together market leading companies across the areas of automation, software, big data, cloud, robotics, sensors and VR/AR. There’s also an Open Technology Forum and packed full of inspirational case studies delivered by proven names keen to share their experience and know-how on improving manufacturing options in the digital age along with pitfalls to avoid and ideas for next steps. In the RobotZone, visitors can take a glimpse into the future courtesy of live demonstrations of the latest robotic technologies in a special 100 square metre display area. The Expo will offer host a new SME clinic with invaluable one-to-one consultancy sessions hosted by independent experts available to delegates.